Years ago, when I needed some me time, I’d fill a suitcase with books, oatmeal cookies, and doll clothes, then get away from it all… down the street to my best friend’s house. I was six, but I’ve relished packing for adventure ever since. Today, I rarely check luggage at the airport, so my carry on has to service all needs–sturdy, light, roomy, and stylish. After trying every version of soft luggage and component system, I landed on Ebby Rane’s Quartermaster spinner. They obviously care about female travelers like me because every detail is considered and it’s all wrapped in an attractive and durable shell. From check-in to the overhead and on to the front desk, I feel organized and elegant making the journey so much more enjoyable. The team at Ebby Rane agrees, so they’re offering a chance to win the same Quartermaster spinner I love. Sign up and pack for adventure! 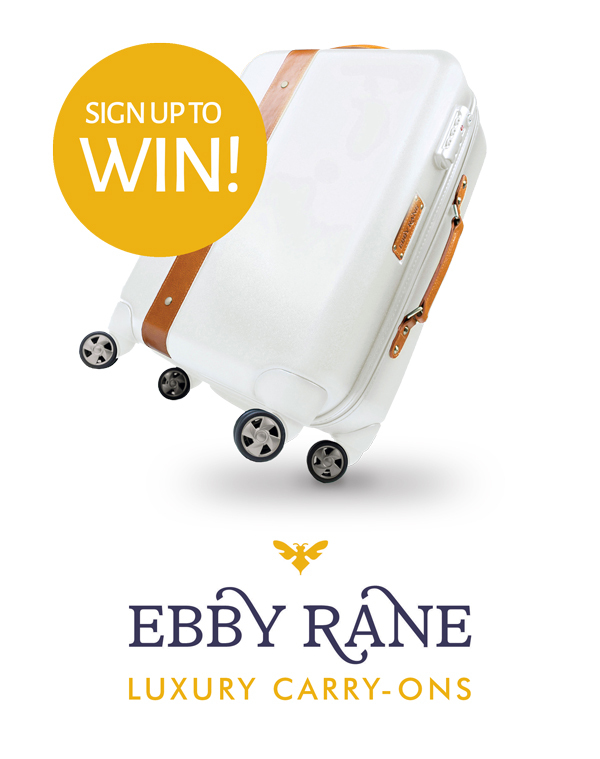 Our amigas at Ebby Rane luxury carry-ons are giving away a Quartermaster spinner like mine, complete with packing accessories for your next surf adventure. To sign up tap here. Isn’t it time to tote your bikinis in style? 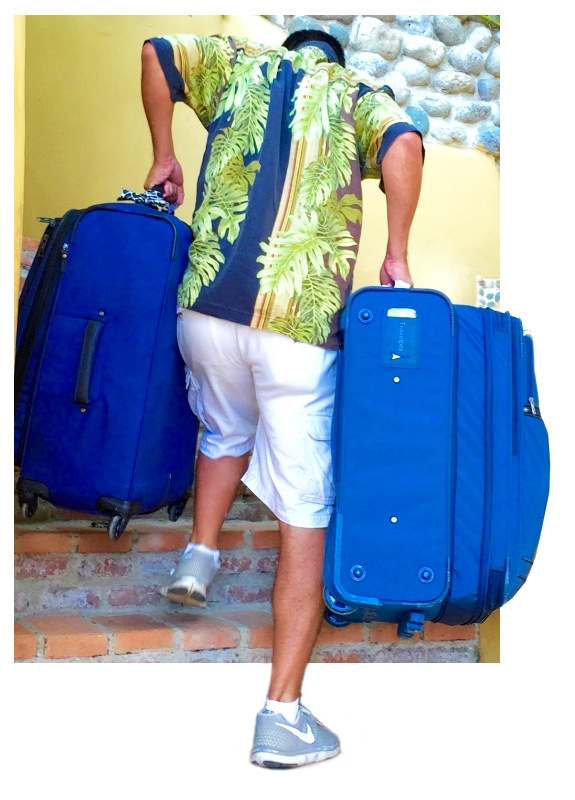 After decades in the travel business, I’m always looking for ways to streamline the packing process and lighten the load. The following suggestions are for the nimble, carry-on traveler. TIP: To streamline the process, load the infinitely customizable Packing Pro app on your iPhone. I pick three colors–black, white, and ___________? Then I ask myself, does every item go with at least one other item? If not, it stays home. TIP: Third color options that work everywhere include khaki, denim, and tertiary or off-colors. Ok, sometimes I add a fourth color for accent, but I try not to mess up my system. TIP: For local flair, buy it there. Seriously, it’s great fun to buy a new top or scarf on-location. I always steer towards wrinkle-free fabrics like microfibers, Lycra®, wool, and polyester that double duty day or night. For example, black yoga pants balance perfectly between working out and going out. Shoes can be heavy and bulky, so be extra critical here. No matter the destination, three pairs is my limit. On surf safari I could get away with just flip-flops for a whole week. They may be a little exposed at SFO in February, but in Puerto Vallarta they fit right in. TIP: I wear my heaviest shoes on the plane. I stuff the others with socks and underwear to keep their shape and pack them in freezer bags so they don’t share odors. When city-bound, I take shoes I can wear all day. If staying in a hotel with a gym or near a park, I pack lightweight cross-trainers. For a night out, black ballet flats can get a table by the window or make a mad dash for the subway. And don’t forget to test your shoe choices against your travel wardrobe. You might not need those candy red pumps. TIP: Never test new shoes on your trip or you could end up carrying a pair of unbearable wedges all through Europe. Put your chargers and adapters in a clear freezer bag for easy retrieval. I don’t pack little speakers if my iPhone plugs into the hotel clock radio, so I bring a short audio cable to plug in my phone for music. I used to bring network cables, but not anymore because wi-fi is everywhere. TIP: Back up your data before you leave! TIP: Put a sticker with your contact info on your tech in the event it gets left behind at the cafe. I’ve hauled enough surfboards to know they’re big and bulky. The airlines charge at least $100 each way and there’s a good chance you’ll get a serious ding. Now I just leave my board at home because I know Las Olas surf safaris has a complete rack of boards at the clubhouse. I love my Ebby Rane Quartermaster spinner. It’s lightweight, spacious, and meets all international carry-on requirements. I searched high and low before I settled on mine, but I wanted simplicity and style. I also travel with an over-shoulder bag as my “one personal item”. It sits squarely on top of the spinner, perfect for lengthy airport connections and waiting in lines. I roll my clothes burrito-style to avoid wrinkles and reduce exposure to stains. If you use a wheelie, put the heaviest stuff closest to the wheels. That way it will stand up at the airport and hotel lobby. TIP: If you turn a white shirt inside out before you roll it you just might save it from travel grime if it rubs up against something icky. The TSA airport security is asking that we put our cosmetics in a separate clear plastic bag. That works for me–it’s my last line of defense against a leaky bottle of nail polish. Zippered packing cubes are becoming popular for organization, protection, and easy transfer to the hotel drawers. I use a couple for small items and toiletries. And I pack my toiletries and whatever I sleep in on top so I can grab just what I need for bed after a long journey. I’ll unpack in the morning. TIP: Pack extra plastic zippered bags for returning home with wet swimsuits and laundry. Most basic cosmetics and toiletries are available at your destination, so don’t fret it if you forget toothpaste. Do take a double supply of any special medications, contacts or extra eyeglasses, naturo- or homeopathic remedies, etc. with you in your carry-on. Remember, any liquids containers over 3.4oz/100ml will be confiscated at airport security regardless of how much is left in the bottle. Get travel rated containers at the drugstore and transfer your liquids before your trip. Don’t bring pocket knifes or multi-tools, nail clippers or files, scissors or swords, or anything metal and pointy. If you wouldn’t run with it, it probably isn’t allowed in carry-on. TIP: Pack a tiny water spritzer for a quick facial pick-me-up after landing in Puerto Vallarta. ¡Fresco! No need to bring your whole wardrobe to Las Olas if you’ll be spending the week in flip flops and surf trunks. Pack light, Ricardo will thank you. When traveling, you’ll enjoy a more en-light-ened travel experience simply by letting go of a few things on your packing list. Beach towels are bulky to pack and at Las Olas we provide a fresh one every day. For travelers moving on to cheaper accommodations or camping, pack a lightweight sarong instead. These do the job well and double up as a tablecloth or lightweight cover-up. Mascara runs, lipstick melts, and blush is natural with a kiss from the sun. Remember our motto: We make girls out of women. So if you didn’t wear makeup when you were a girl, it’s likely you don’t need it at Las Olas. If you can’t live without cosmetics (and you know who you are), go for a natural glow with minimal fuss. We all love denim, but for a surf trip it can be uncomfortable and bulky to pack. Opt for yoga tights instead. They work well for both yoga classes, knocking around, and surfing. Yes, you can even surf in yoga tights! They keep your legs from chaffing on the surfboard and they look pretty cool. You’ll find a hairdryer in your villa, but why use it? Wavy beach hair is what surfer girls are famous for and beach hair goes well with your new girl-ish glow. If you need to blow dry your hair before catching that plane home, salon services are available. Leave your fancy shoes at home. Flip flops are the shoe of choice for dusty roads leading to the beach. We recommend wearing comfortable shoes on the plane. Save those heels for back home. Nothing says “pick me” to a thief like sparkly bling, so whether you’re traveling to surf camp or heading downtown, keep jewelry to a minimum. And you don’t want to risk losing expensive baubles in the surf. If the piece is meaningful to you, leave it home. Inexpensive, bohemian jewelry is available throughout town or offered by vendors parading down the beach. We provide a reef-safe sunscreen for our guests. It’s medium duty, transparent, easy to apply, and there’s plenty on hand at our private clubhouse La Casita. Apply before surfing, early and often. Unless your surfboard has magical powers, leave it at home. It’s difficult to pack and there’s a good chance it’ll get damaged. Worse, you can lose a board on a connecting flight. We provide a wide range of excellent boards for all our guests ranging from beginner foam boards to custom longboards by pro-surf instructors Kristy Murphy, Julie Cox, and Ashley Lloyd. Many beginners graduate to the fiberglass and epoxy boards quickly, so try a different board each day! Our villas have standard US 110V electrical outlets for phone chargers or whatever gadget you can’t live without. Leave your hardcover library on the shelf. You’ll save your and bellhop Ricardo’s back by downloading reading material to your phone or tablet. If you do bring books, grab the paperbacks for some light reading. You can leave them in the villa after you’re done. This will add to your en-light-ened experience. You can’t walk a block between drugstores here. You can find anything from aspirin to deodorant. Many prescription drugs are available here in Mexico… with a prescription. If you can, leave it at the office. Smart phones are great for keeping in touch with people at home. You can access free, reliable wi-fi in your villa and in restaurants around town. Remember, if you bring your laptop, you’ll be more tempted to work and it’s our job to take you away from that. TIP: I organize camp items and personal items using packing cubes in different colors so I can easily find things. I never pack without them! If you need quick answers, browse At A Glance and FAQ. If you can’t find what you’re looking for, call us at 831-625-5748, email at surfing@lasolas.surf or tell us what’s on your mind in the form below. For a quick tour of Las Olas surf retreats, visit At A Glance.